Queen Beans and Wannabes: If he has to ask you what 'a Yuppie is', He’s too Young for you Sis! If he has to ask you what 'a Yuppie is', He’s too Young for you Sis! Ah, the 1990’s- my own personal belief is that the 90’s were indeed the best decade since the Renaissance. ..or somewhere close to that. The crazy style, the awesome music, the great vibe, that decade of the 90’s. 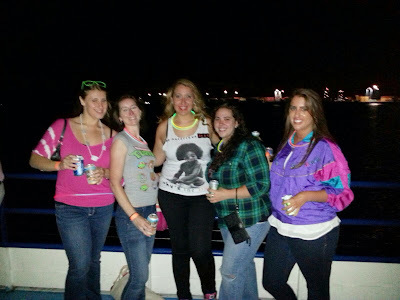 My friends and I love to reminisce about the 90’s and the great music; so when I saw an event for a 90’s Boat Cruise hosted by Social Boston Sports- we were on it quicker than Cher could say “As-If”. Although the “90’s look” is coming back into style, or at least the Hipster version of the 90’s style, it was very tough to find something to wear that I would wear back in the 90’s. I didn’t have time to raid back at my mum’s house to find pictures of me in that decade and exactly I wore- I do remember bell bottom’s or flare pants came into style, Ying-Yangs were awesome and putting more butterfly clips in your hair than you head could hold was the absolute fashionista trend, (or at least it was for me). I decided to make a trip The Garment District to see if I could find something to my best memory of how I looked or wanted to look during the 90’s era. After some thorough digging, I was able to find a cute Bebe dress in silver in a square cut that looked like it would fit me perfectly- of course I didn’t actually try on the dress, I simply purchased it for $8 and went on my merry way. Friday was the day of the cruise and after working all day, I was ready for a night out with the girls. After work, I tried on my dress for the first time to see how amazing it would look. As soon as I put it on and look in the mirror, my mouth dropped… the dress did “fit”, it covered all the essential parts, but left nothing else to the imagination. It was so short and tight, one wrong move and I was exposing everyone. There was no way I could wear this dress in public and not get either solicited or arrested for prostitution. By this time, I had less than an hour to decide what to do: go home and grab jeans, run to Macy’s and purchase something, or just go in my worn out work clothes. I decided to run to Macy’s as quickly as possible and attempt an outfit swap. To my surprise, I did find an entire section of t-shirts with ‘Teenage Mutant Ninja Turtles’, ‘Rugrats’ & ‘Coca-Cola’ on them…sure Teenage Mutant Ninja Turtles would work just fine… and so would these cheap looking straight leg stretch jeans. Well, $40 (so much for my $8 bargain), and a change of clothes later, I was set to run down to the boat to meet my friends. Only problem, I spent so much time looking for an outfit, I had only 5 minutes to spare to get to the boat, and I had to bring all my work clothes & bags with me. My friends all end up wearing jeans and t-shirts as well, so at least we were all able to fit in…although a few people had a tough time deciding if they were on an 80’s or 90’s cruise. Once we hopped on, I was able to find a secure hiding spot for all my stuff and we were able to grab a few drinks and relax. The cruise itself was good although not really what we were expecting. There were many people who were born in the 90’s and less people who actually lived in the 90’s. The music that was played was more of a mix between 90’s and early 2000’s, (yes, there is a difference and more than enough great music from the 90’s to play for a 3 hour cruise). Although not overly crowded, the 5 of us were able to find some space for a little dancing and a little socializing. 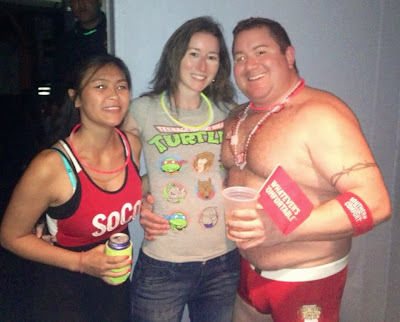 I did run into a familiar face, The SoCo guy, aka Chuck, who I met at SkeeBall events, was on the boat with us giving out free swag and specialty drinks. After a couple of those specialty SoCo drinks, my friend and I were feeling more relaxed and were having a fun time reminiscing and dancing to our ‘90’s music soundtrack to our lives’, when we were reminded of how old we actually were. As we went outside to grab some air, we started up a conversation with another group of people, a mix of guys and gals; some dressed up some not too much. One of the guys was wearing a suit and he mentioned he had just come out of work before the cruise. I laughed and told him he could tell people he was dressed as a ‘yuppie’, and he would be all set. The young gentleman looked at me with quite a confused face and asked; “What’s a ‘yuppie’? I was born in 1991 so I’m only 22 years old”. At that moment, I simply looked at him, told him he just put me in my older age bracket and that was the end of the conversation…and the end of the night for all us ‘almost 30 year olds’. Bloggers’ Brunch on the Odyssey Cruse! SkeeBall Season 6: Where Champions are Made!